Yesterday I was extolling the virtues of always having a smartphone handy at all times… But today, I’m kind of wishing it wasn’t quite so easy to share info [heads up – if you are squeamish, maybe you should skip this post]. 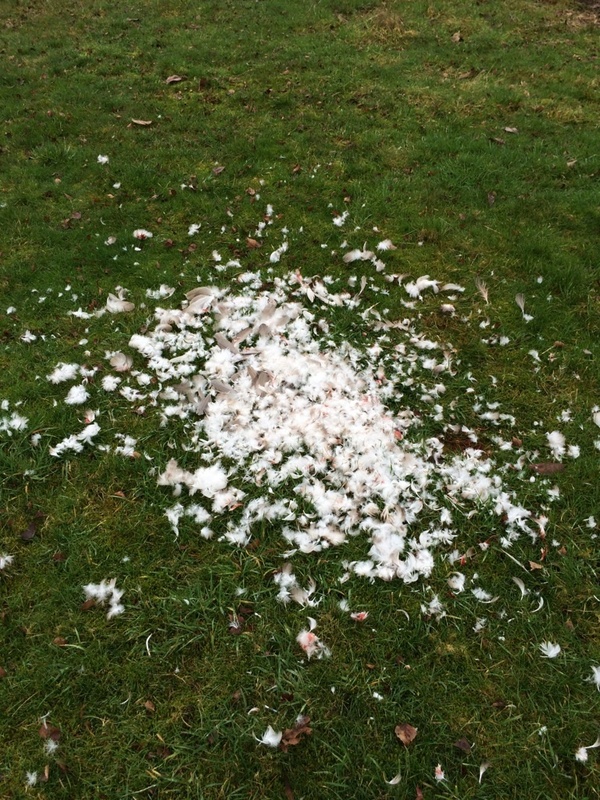 Most likely, this is was one of my adventurous ducks… Hard to say what got her – eagle? Hawk? Owl? Raccoon? When this happens it makes me question just how good an idea it is to allow my birds as much freedom to roam as they get. This is the harsh downside of free range poultry. Some stick close to home, but some venture out into the open areas (like over at C’s place, in the field) where they are pretty vulnerable to overhead attacks. I also have a few that have taken to roosting on the barn roof at night and have now, in the wake of this loss, moved ‘re-clip duck wings’ up to the top of the To-Do list. This will help keep the ducks closer to the ground, which makes them easier to herd into their shelters at night. Clipping wings does, though, make it harder for them to get away from ground-based trouble-makers like dogs and raccoons. It is tempting, when confronted with a pile of feathers and birds that just don’t listen to my suggestion that they stay close to tree cover, to say – That’s it! Confinement in pens for all of you! 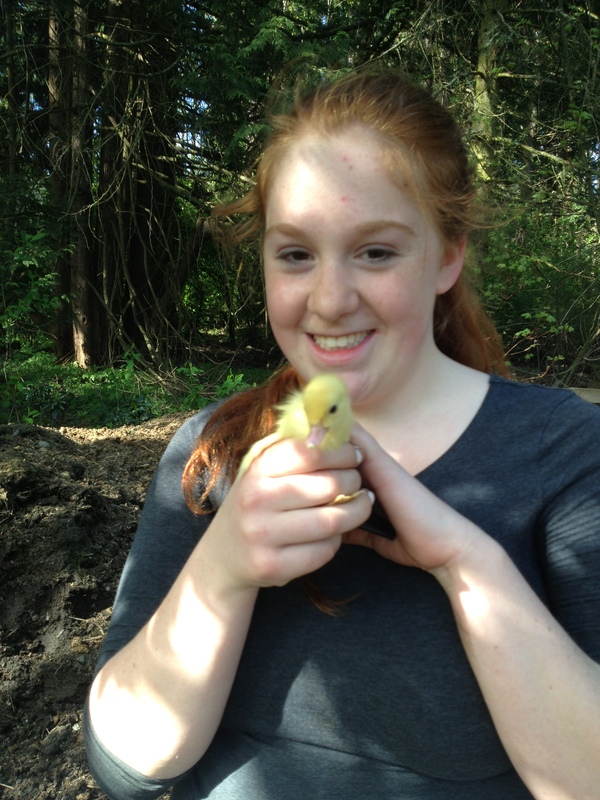 What Goes on in a Duck’s Hypothalamus? How do they know? 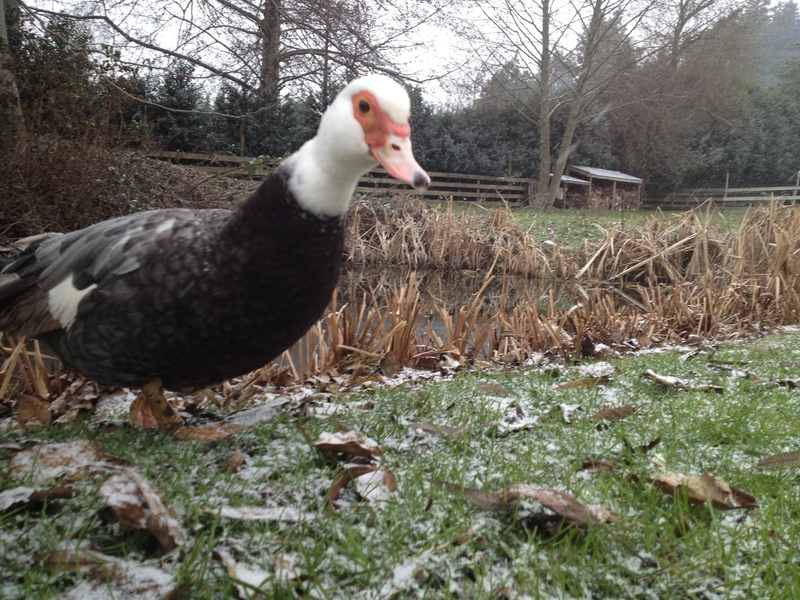 Each year, within 48 hours of the winter solstice the ducks start laying. Not all of them and not a huge number of eggs, but as sure as you can say ‘here comes the sun’ those girls have a meeting, set up a schedule, and fire up the production line. This year, the solstice was on December 21st and the first duck egg appeared on the 23rd. We are now up to about four a day from my flock of 25 even though it has been cloudy, dull, and rainy. How do the ducks know that we are gaining a few precious minutes from day to day? I can barely tell when the day begins or ends when it’s this gloomy! What I do know is they will produce duck eggs from now until some mysterious meeting in late July when they take off their hair nets and shut down the line until the next winter solstice rolls around. When they hit their stride and the new girls (from last year’s hatch) get broken in, I should get between two and three dozen a day during their peak laying months of March, April and May. There are always a couple of super stealthy ducks who manage, somehow, to shoehorn themselves into impossibly tiny spaces to sneakily lay a clutch of eggs. When a couple of them gang up on me and share a secret spot, this can result in a huge clutch of accidental ducklings. The females are welcome to stay, but the drakes get large and argumentative and exhaust the poor females and unless we are eating them ourselves I have to haul the extra boys three hours north to the closest processor that will handle ducks [this unfortunate situation is the subject for another post on another day]. I’ve long been impressed with the ducks’ ability to detect the changing length of the day but didn’t really know what the mechanism was. Turns out it has to do with light receptors located deep in the brain in the hypothalamus. Bird skulls are pretty thin and enough light passes through the bone to reach these receptors, which then stimulate hormone production relating to egg production and mating behaviour. For more details, this University of Oxford article is interesting. This could also explain why ambient light from cities is messing up wild bird breeding schedules. Too much overnight light in urban areas also causes more nocturnal activity and changes in breeding patterns in city birds. City birds also have altered levels of melatonin, a change related to altered light levels. For a bit more information about the melatonin findings, here’s an article on the Science Daily website. If I were trying to maximize my production I would add light to the ducks’ environment to trick them into starting earlier in the season and laying longer. I haven’t studied this scientifically, but it makes sense to me that the ducks might have longer productive lives over the long haul if I let them take a break each year the way nature has worked things out. I may not get every last possible egg from my girls each year, but they seem to keep going year after year and some of the older ducks are fantastic mothers. [And, finally, a quick follow-up note to yesterday’s post… Not only did the poll come in with a resounding ‘keep doing what you’re doing’ result, some of my favourite bloggers left lovely comments… In case you aren’t following the comments thread, I’ve cut and pasted my response to the responses below… Thank you to everyone who took the time to share your thoughts/votes! The next few days look like they are going to have a similar theme: sorting and reorganizing. [Image D. Craig, Min of Agriculture] – Some of last year’s Toms in the breeding group. The Christmas birds are going to be processed on the 21st which means I’ll need to pick the very best birds to hold back for breeding. I’l be looking for decent size and reasonable growth speed (there are two groups – a younger and an older and there are birds from the younger group that are actually much bigger than birds from the older lot), decent temperament, and, finally, more or less correct colouring. I’ll keep 2-4 Toms in the breeding group and 10-12 hens. That way, if someone comes along who would like a breeding trio, we can accommodate them. The birds will be useful through the breeding season, producing a good variety of poults for sale as well as my next year’s Christmas birds. Some of those breeding birds will have reached a good size by summer and when the laying and hatching season is over, some of those can be processed for a few Thanksgiving customers. I will likely also hold back some of the scrawny stragglers for the same purpose. 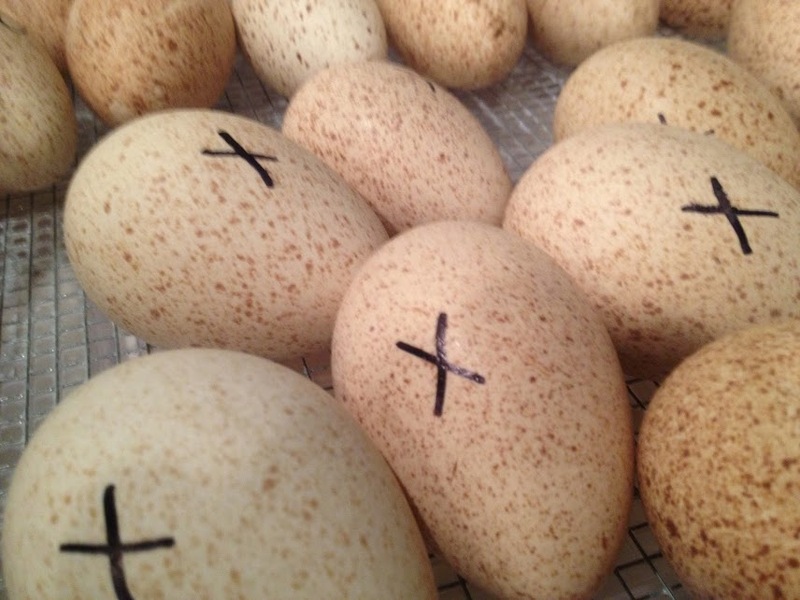 We are also slowly building a customer list of people who are interested in turkey eggs for eating. We love them, but it is very uncommon to find eating eggs in stores (can you think of a time you saw a carton of turkey eggs at a shop?) and it just doesn’t occur to people that turkey eggs are an option for the frying pan or baking. 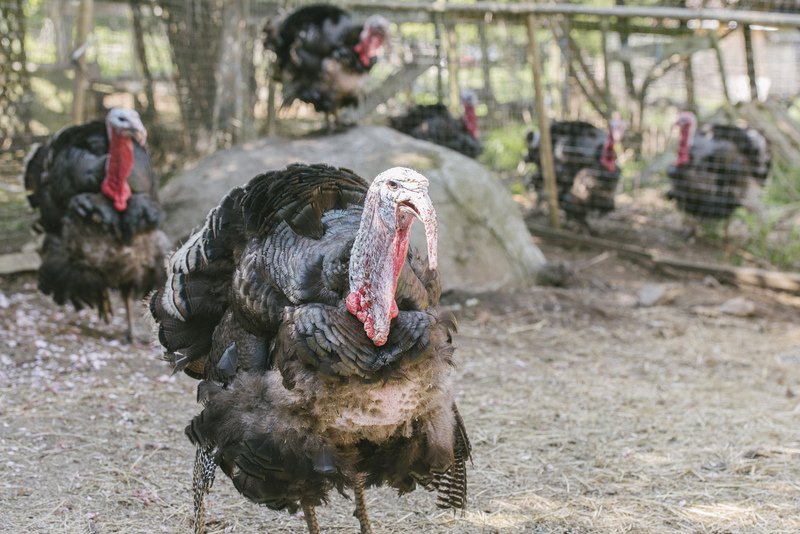 Without the competition from the larger flock and some extra time, the smaller birds will have a chance to grow out in time for Easter or Thanksgiving of next year. 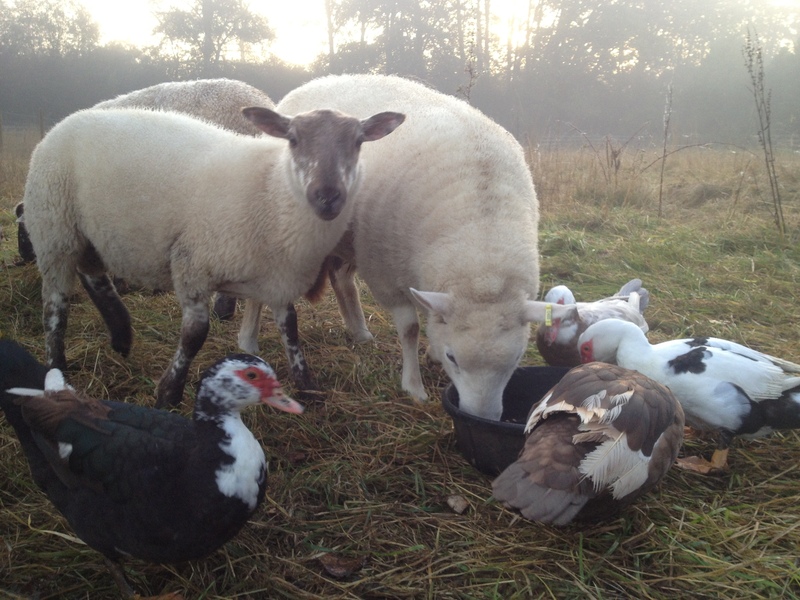 Carrying more than 15-20 birds year round gets very expensive – commercial organic feed is exorbitant and during the winter months there isn’t much decent pasture for the birds to devour. And devour they do! 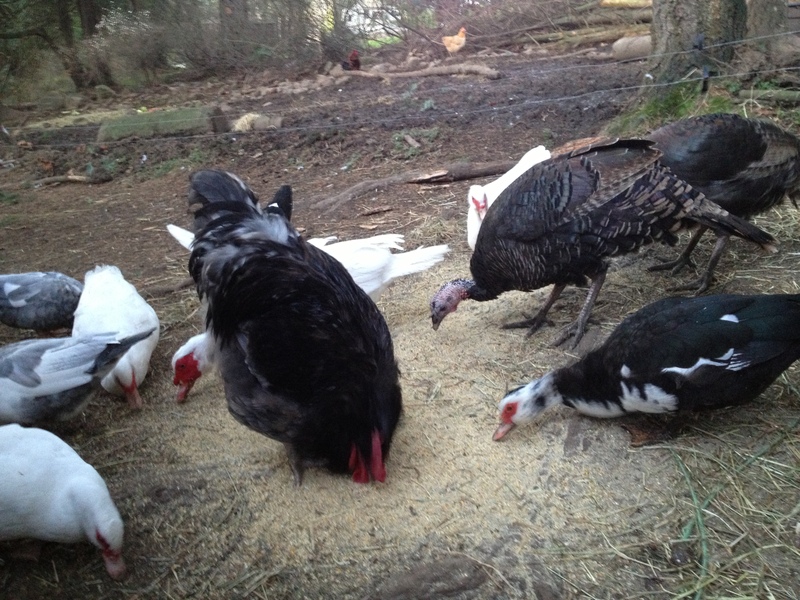 Hungry turkeys eat an incredible amount each day and though I supplement with hay and veggies and softened alfalfa cubes (plus whatever they manage to find themselves), the feed bill gets out of hand very fast when I’m feeding too many birds. Of course, the keepers and those destined for fine dining are to be found scattered between my two main groups of turkeys, which are raised in two different locations. This will mean penning, sorting, and transporting birds from A to B and B to A and then, the night before they leave the farm, loading the dining birds into the stock trailer for the short ride to the processor. We will also need to make sure we have more or less the correct number of birds of approximately the right size to fill the turkey orders. [Image D. Craig, Min of Agriculture] Freckles, one of the ewes soon to be introduced to the ram, Babar. Meanwhile, our new Cotswold ram will move from the farm where he has been spending the past number of weeks to the sheep fields. 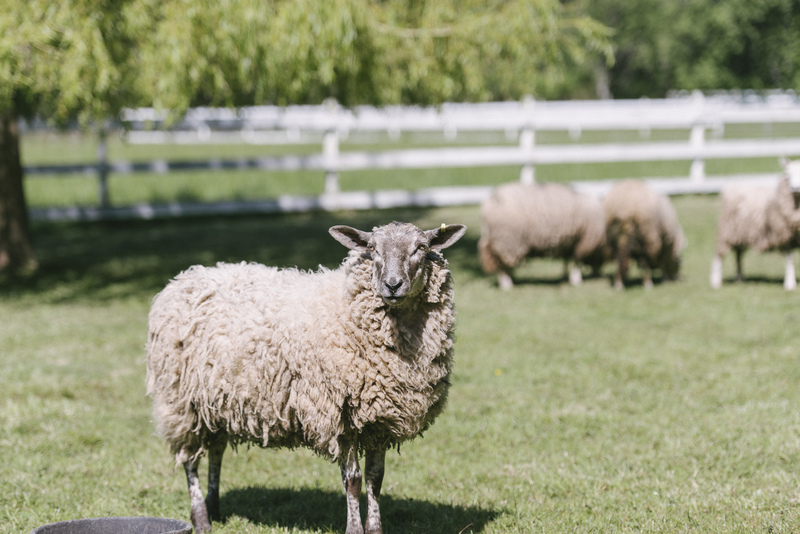 But, before he can get here, we need to move the ram lambs to their own field and separate the small ewe lamb who is too young to breed (she will spend the next couple of months hanging out with the goats). Only then can we introduce the new ram to the ewes to be bred for late spring lambs in 2014. The ducklings from this summer are now also ready to process, though whether or not I can get coordinated to run them up island before the holidays are full upon us is another question. The ducks will stay with the layers (each year we increase the numbers a bit to try to keep up with demand) and all but two of the drakes will go for processing. 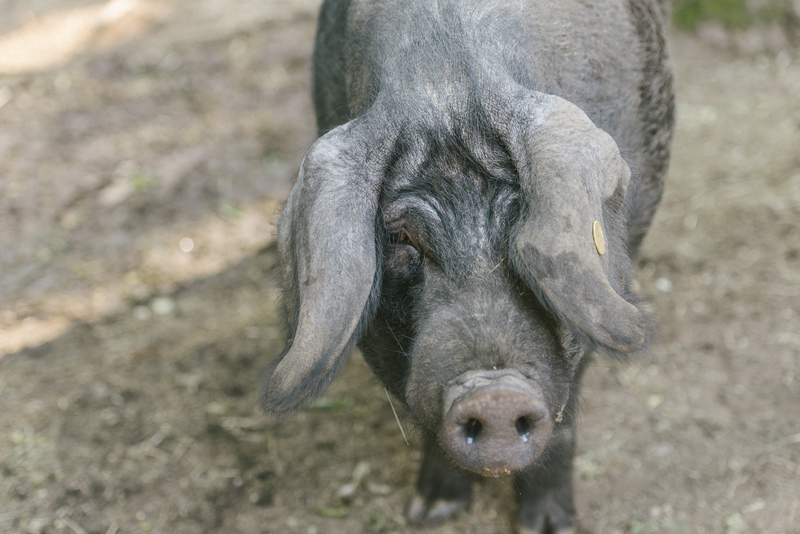 [Image: D. Craig, Ministry of Agriculture] Pompadour, our Large Black Hog boar, ready to do his duty and sire more piglets. And, finally, the piglets still are not fully sorted and reorganized. Olivia’s piglets are in a separate paddock but after a spectacular bolt down the hill and through an electric mesh fence, Cora is back in with her little ones. We will give that another go, perhaps tomorrow, to see if we can’t get all the weaners in one place and all the sows back together in another. Pompadour will then be called upon to woo the two mothers and we will continue to watch Pearl closely for telltale signs that she is pregnant (she has been in with him for a month or so now, so it won’t be long before she starts to bulge a bit). The chicken sorting can wait until the new year, but not too long as the heritage birds do take their own sweet time starting to lay, so an early start is definitely an advantage. Wimpy will get to move into his own area with the four gorgeous Black Orpington girls who are now mature and ready to get to work in the spring. 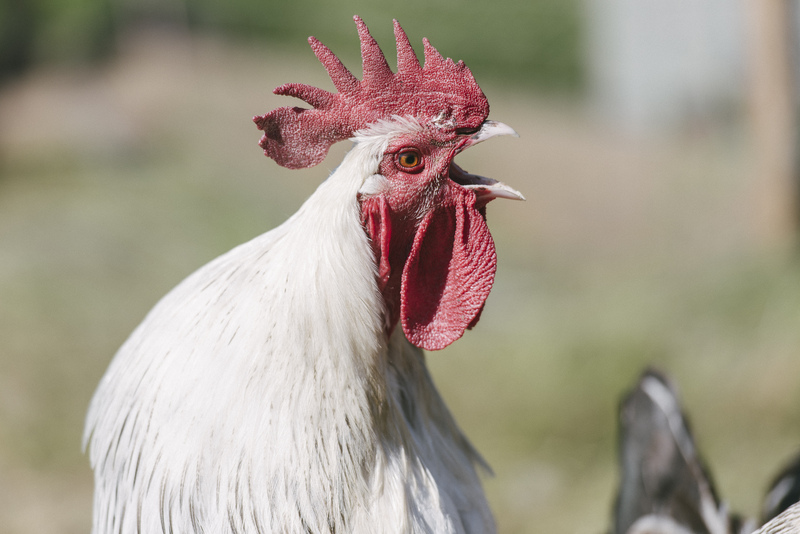 [Image: D. Craig, Ministry of Agriculture] Bill, the light Brahma rooster yelling about something… probably protesting my plan to take away his stunning Black Orpington girls and give them to Wimpy. So, for the next few days it’s going to be all about counting and patience, because even though it may seem like a simple thing to move some piglets from pen A to pen B and sort out a few dozen turkeys, the critters seem to have a knack for being particularly uncooperative when their routines change. Wish me luck! I don’t know why anyone thinks that calling someone a ‘bird brain’ is an insult. I have a lot of birds around (turkeys, ducks, chickens, and a cute little cockatiel up at the house) and I can tell you they know exactly which end is up. The farm birds range from a group of laying hens procured as pullets to fancy light Brahmas I raised here. We have a few spare roosters, a flock of fancy bantams, and some gorgeous Black Orpington hens. Our Muscovy ducks produce some lovely ducklings each year and the Ridley Bronze turkey flock is made up of a mix of those we grow out for holiday table birds and our breeding flock (the Ridley Bronze birds are a Canadian heritage breed that has been teetering on the edge of extinction for a number of years). Most of the time, the birds do their own thing, roaming around hunting, pecking, posturing, and procreating. They never go far first thing in the morning because that’s when they get their major meal. Then, they scatter, scavenging lost morsels the hogs might have missed, making trouble in the hog water (if they are ducks), and sneaking off to lay eggs if they are chickens. The turkeys have the worst case of wanderlust of all of them. They make their rounds to various neighbours (thank goodness the neighbours don’t mind too much!) 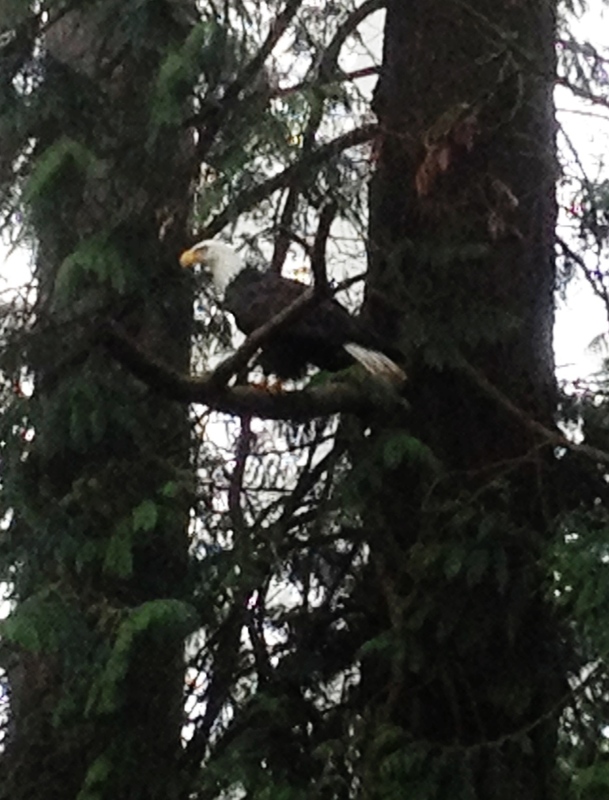 and all over our property, gleefully hopping over fences and leaping from branch to branch in the trees. They know where the best bramble patches are (late, sweet blackberries are a favourite! ), the plumpest seed heads on the tall grasses growing along the edges of the fields and ditches by the road, and have memorized every place where I might ever spill a few grains of feed on my rounds. 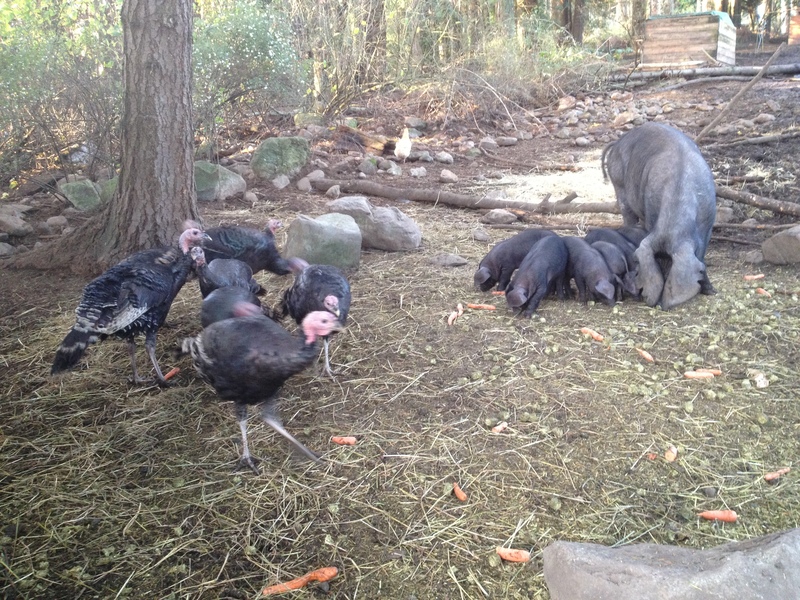 The turkeys are totally in synch with the hog feeding schedule. The ducks are particularly fond of the the manure mountain and pick through the recent deposits in search of red wigglers. 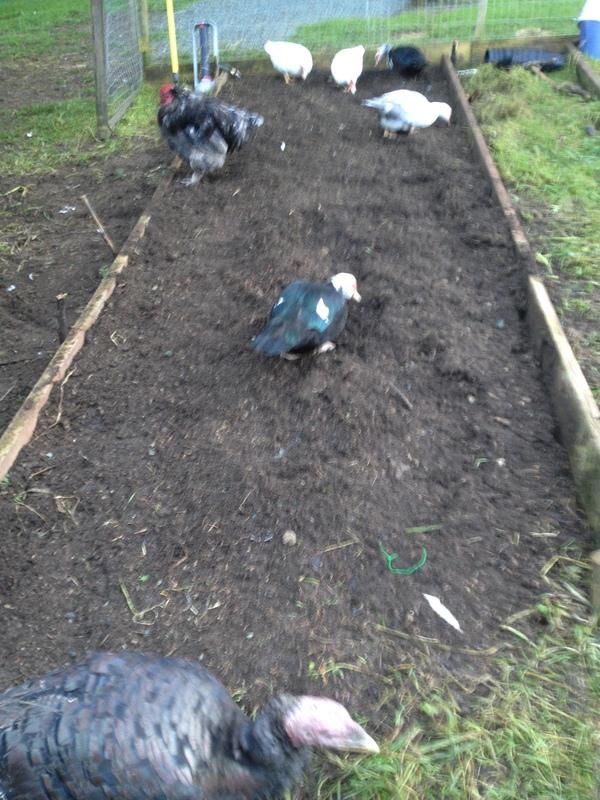 The pile is full of worms turning it into rich compost, so the ducks have a field day feasting. 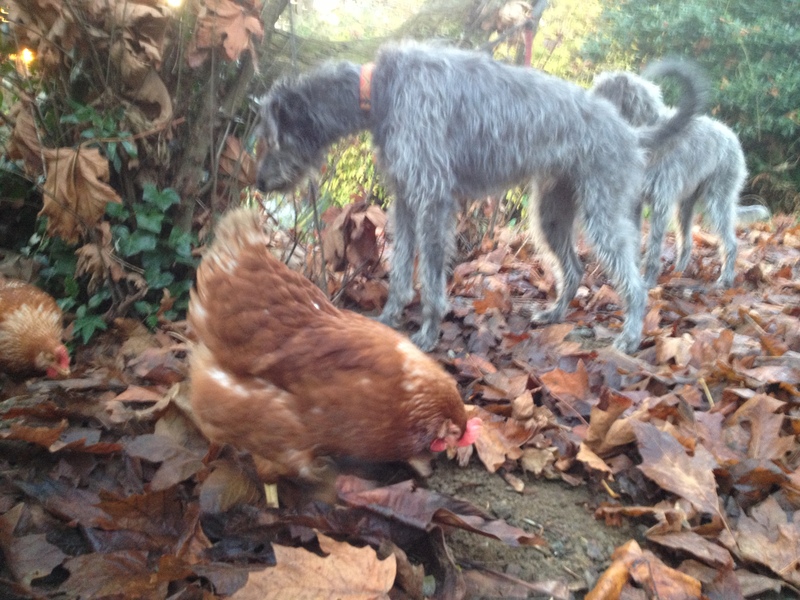 They also do a round of the areas of the vegetable garden I’ve opened up for them – they, along with a few of the chickens, are on weed-pulling and slug-annihilation detail. 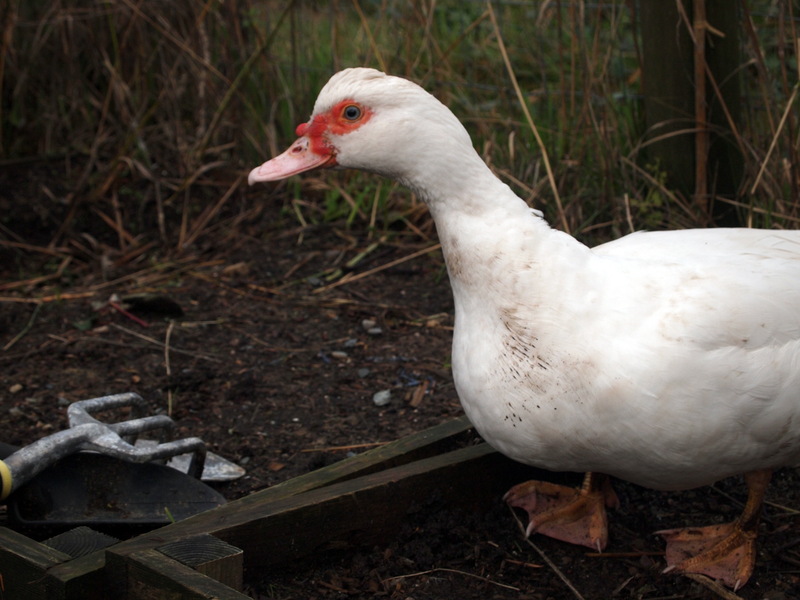 The ducks are also marvelous for trimming the grass paths between the beds, a task they eagerly look forward to each autumn. No matter how busy they have been or what treats they have managed to find during the day, every free-ranging bird on the place knows when it’s three o’clock: time for seconds (thirds, and fourths)! I will head down the hill to do the afternoon hog feed and be met at the feed room door by a sea of bird beaks and beady eyes. The turkeys and drakes are the pushiest, literally crashing over the stacks of feed buckets in their haste to beat me to the feed bin when I enter the barn. Yesterday, a young Tom turkey launched himself into the air at the same moment I opened the lid of the plywood feed bin. A great flailing of gangly turkey wings and legs followed and there was much thrashing and indignant complaining (from both of us!) until I could haul the bird out of the bin and send him on his way. The birds are such a menace, the only way to get them out from under foot is to throw a bit of feed down outside. As I was doing this today it occurred to me the birds have totally won this round of farmer vs livestock (why would I think otherwise? I’m still way behind in the game of ‘Put the Turkeys To Bed’). They have very efficiently trained me to start the hog and horse feeding rounds in the afternoon by tossing bonus grub to the birds! Sigh. I don’t have a hope if my motley flocks start talking to their wild cousins.